I fell in love with Nina Ricci on my 18th Birthday, when I got a Nina Ricci Watch. It was the first time in my life that I saw a watch as an investment, rather than someting to just tell the time with. I still have this watch and it's a perfect timepiece. I love how elegant it is and how, despite being very expensive, it's not at all showy. It's definitely a classic and I know it's somthing I will have for the rest of my life. And that is how I first discovered Nina Ricci. Nina Ricci was founded by Maria Nielli and her son Robert in 1932. Maria discovered her love of fashion at age 13, when she began an apprenticeship at a dressmakers. In 1948, Nina Ricci launced its 'L'Air du Temps' perfume. The bottle is iconic: It has doves on it. I've actually grown up with this fragrance. It's my mum's favourite and I can't remember her dressing table without it. I think she discovered this fragrance in the '80's and has always had a bottle of it. I love everything that the brand stands for: it is romantic and very feminine. Everything from their collection is so elegant, classic and sophisticated. 'The Nina Ricci woman will be at ease with her age and femininity. She is both sensual and playful, always looks modern, and is armed with a sharp eye for cut, fabric and detailing'. 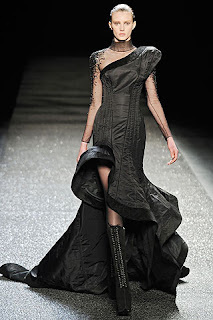 Designed by Olivier Theyskens and I absolutely loved it! It was so hard narrowing down the pieces that I liked. Its very magical and dark, and really is perfect for the Autumn. I really like the all black and almost futuristic styles to it. 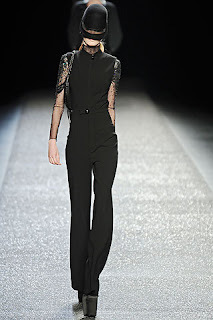 S/S 10: I loved the catwalk for this season. The colours are really nice and pastely and I'm loving all the neutral colours as well. It was the first catwalk done by Peter Copping and I really liked it. I'm particularly liking all the ruffles! I love your blog! It's inspiring! 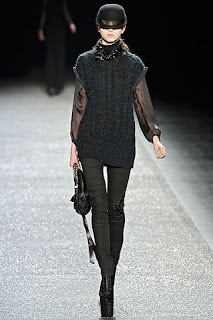 Ana Nina Ricci is amazing! Fabulous post! The Nina Ricci watch is lovely. It's so simple and elegant. Definitely a classic piece that you'll have for a lifetime! Great post! I love her collection. It is so unique and creative. I love it when designers take a risk. It is a great time for women with the ruffle skirt making a return to fashion! Gorgeous watch, runway looks, and collage! I adore Nina Ricci for gowns!! Nina is so inspiring. I love her looks. The most amzing is the top one on the left and the two long dresses they are simply stunning. Both collections are so stunning. I love your favorite picks. my procrastination is getting worse too! right now, i'm blogging instead of being in class /: and the crazy thing is, i actually like class! i just can't make myself work right now. haha, oh well... it's bound to get better at some point, right? hey Sherin just letting you know that your guest post will be posted tomorrow around 1:30! I appreciate a little bit of history with the eye candy! I've loved the past two collections so much! Love what you've put together in your Polyvore set. 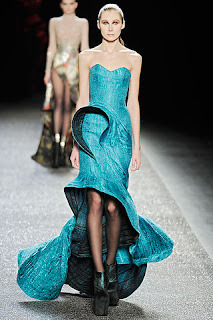 And, really like that turquoise dress from A/W 09. Gorgeous! Also, check out my blog - I gave you an award! i love your polyvore collage. Nina Ricci is such a classic, they have great perfumes too! great post. nice watch, too.. i've never owned a watch i liked. That mini dress is too freaking gorgeous! I love Nina Ricci and have a few NR items that I just adore. Always perfectly elegant, gracious. i love those catwalk pictures!! I like all of the ruffles too and the watch is very classy, hope you ladies had a great weekend! Настоятельно новейший сайт [url=http://obzormania.ru/igronevs/127-instrumentarii-dlya-battlefield-3-poka-ne-budet.html]Инструментарии для Battlefield 3 пока не будет[/url] , даже про [url=http://obzormania.ru/main/53-vse-taki-poka-ne-zakroyut-exua.html]Всё таки пока не закроют Ex.ua[/url] описано. Распродажа аккуанты Facebook.com PVA Plus , Mail.ru Second Hand , Odnoklassniki.ru Code , Mamba.ru Real M и подобные. онлайн магазин аккаунтов твиттер , yahoo.co.uk , yahoo.com liveinternet.ru/ , купить аккаунты лавпланет , продажа аккаунтов wordpress , магазин аккаунтов , продам аккаунт livejournal , можно ли продать через myspace , редиректы pochta.ru , продажа аккаунтов facebook , купить аккаунт вконтакте , купить аккаунты лавпланет , купить аккаунт facebook , интернет магазин где продаются дневники майл ру , мамба аккаунт , купить аккаунт в gmail , аккаунты мамба , онлайн продажа аккаунтов вконтакте , продажа аккаунтов вконтакте , магазин аккаунтов:онлайн продажа аккаунтов mamba.ru mail.ru , онлайн магазин аккаунтов вконтакте , продажа аккуанты blogs.mail.ru , вконтакте аккаунт купить , купить аккаунты вконтакте онлайн , yahoo.com liveinternet.ru/ , магазин почт yahoo , аккаунты diary.ru , купить аккаунт яндекс , yahoo hotmail продам , магазин аккаунтов вконтакте , mamba real status , покупка аккаунта mail .